Many of us enjoy a little Christmas cheer during the festive season – bubbly, wine, beers and spirits with or without mixers. Even the non-alcoholic beverages might be enjoyed more often than normal: soft drinks and fruit juices might be consumed throughout the day for several days on end during those catch-ups with family and friends. It’s important to know that all of the beverages mentioned above are acidic and may contain sugar. 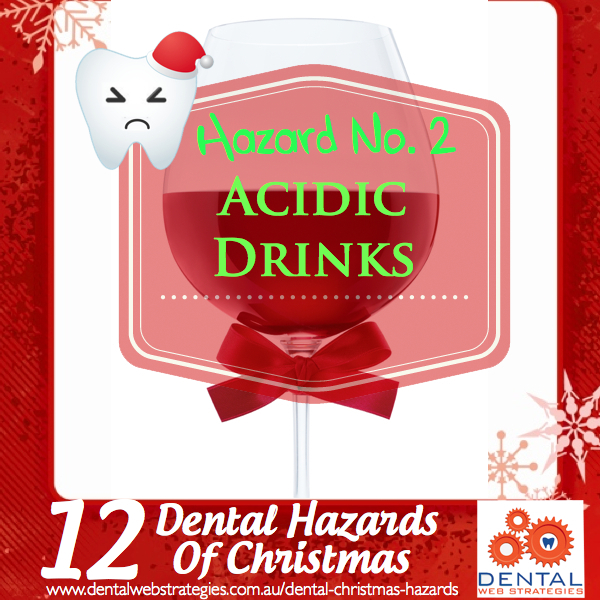 Acidic drinks can cause dental erosion. This is an irreversible condition where the tooth’s protective outer coating, the enamel, is dissolved by acids. Once the enamel has been removed, it can’t ever re-form or grow back. Increasingly we are finding that the source of this acid is from foods and especially beverages, including soft drinks, fruit juices and wine. To limit the damage caused by consumption of wines and soft drinks this holiday season, the Australian Dental Association suggests “swishing a mouthful of water around every so often to increase saliva flow and rinse away sugars and acid in your mouth”. You could also try chewing sugar-free gums to stimulate saliva flow and clear the mouth of sugar and acids. Eating foods such as cheese can also help to neutralise the acids in your mouth.